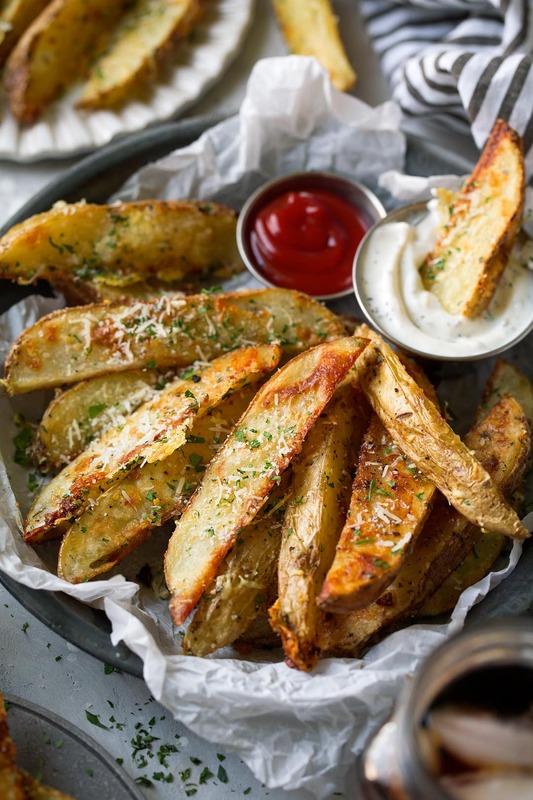 Baked Potato Wedges are one of my families favorite side dishes! This garlic parmesan version is so easy to make and they have such an irresistible flavor. 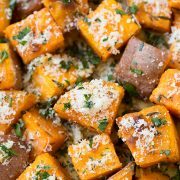 So good they might just become a new go-to side dish! I love how the parmesan that they’re coating in helps the outsides become nice and crisp while the insides say perfectly soft and tender. Plus I love the flavor cheese adds and the hints of garlic. These are perfect for those times when you’ve got a french fry craving but don’t want to splurge so much. They’re baked (or technically roasted) instead of fried and they’re coated with olive oil instead of using the traditional vegetable oil used for french fries. I mean, these things are good enough that you’ll forget all about that main dish. 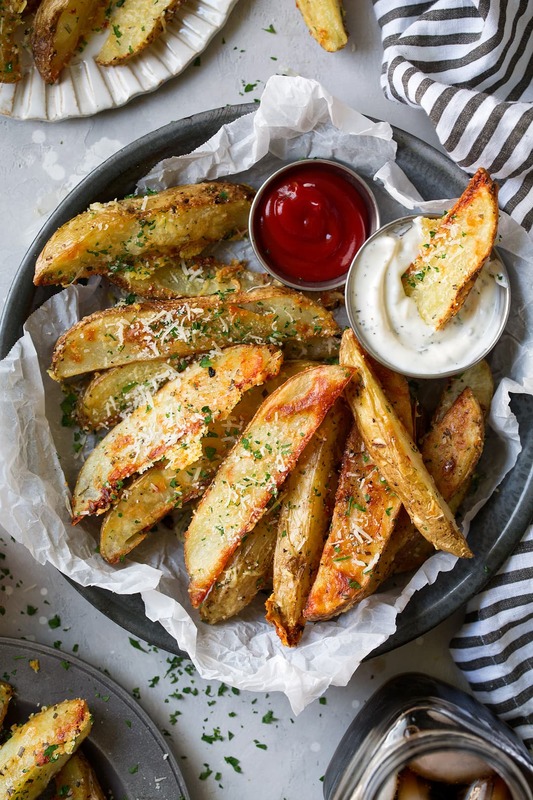 Pass more potatoes wedges please and thank you! Preheat oven and grease baking sheet. Rinse and cut potatoes, place on baking sheet. 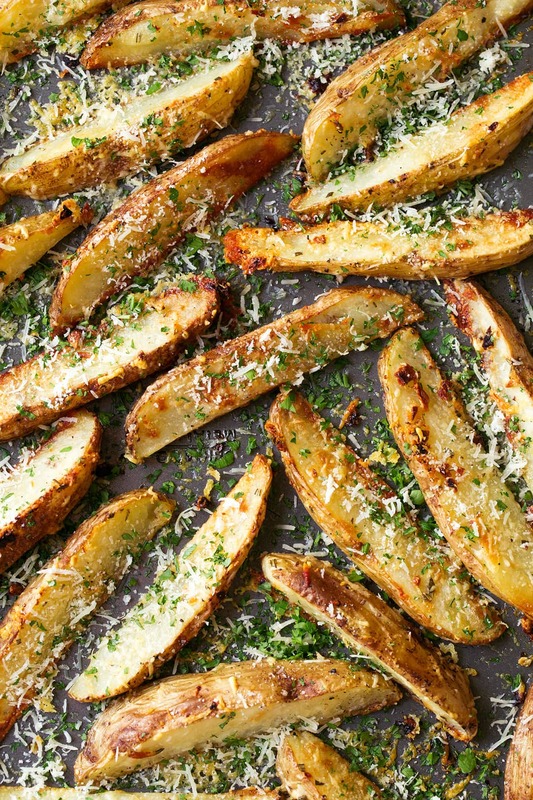 Drizzle potatoes with oil and sprinkle evenly with parmesan, rosemary, garlic powder and season with S&P and toss. Spread into an even layer, laying potatoes on one cut side. Roast turning potatoes halfway through. Broil during last 1 – 2 minutes. Sprinkle with a few more tablespoons parmesan and parsley. Cut them as even as possible so some aren’t done before others. Use powdered parmesan if desired but go for the refrigerated kind. Don’t skip the broiling step because it helps crispen them up as well. Just be sure to keep a close eye on them so they don’t burn. Serve warm for best results. Any fry or potato wedges is much better warm right? These are good with ketchup but I like options so I made a second simple dip to pair with them. Which is totally optional. It’s a light mayo and Greek yogurt based dip that’s perfectly rich and creamy. And it’s lightly seasoned with dried basil because you don’t need a lot of flavor. 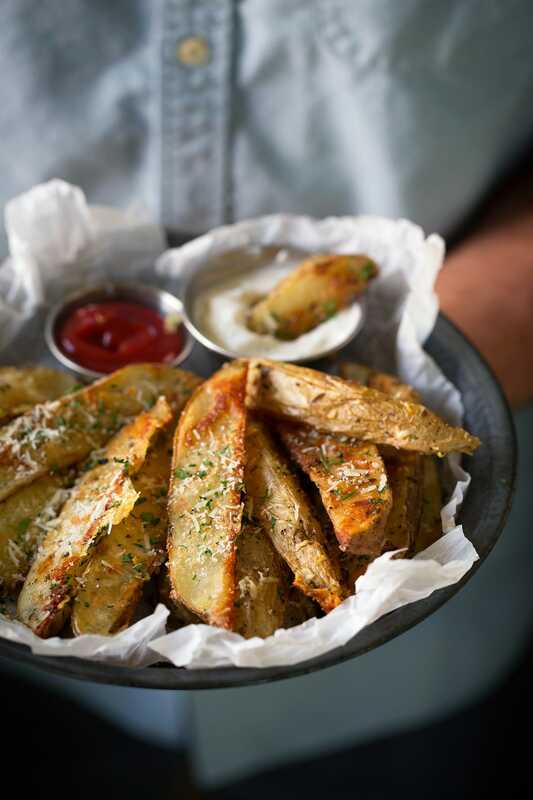 These Baked Garlic Parmesan Potato Wedges are one of my families favorite side dishes! They're easy to make and oh so addictively delicious! Preheat oven to 400 degrees. Spray an 18 by 13-inch baking sheet with non-stick cooking spray. Scrub and rinse potatoes. Cut each potato in half then cut into fairly large wedges (about 8 total per potato). 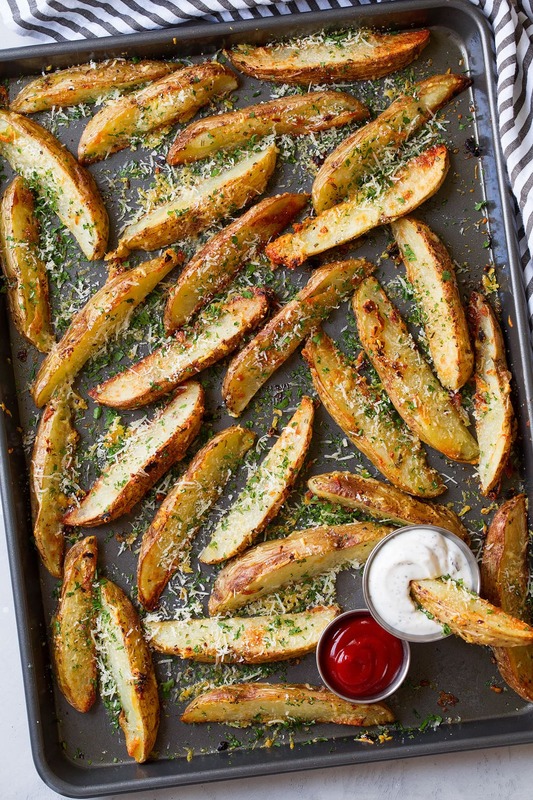 Place potatoes on baking sheet. 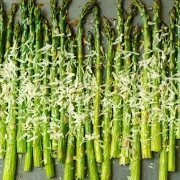 Drizzle with olive oil, sprinkle evenly with parmesan, rosemary, garlic powder and season with salt and pepper (about 1 tsp salt 1/4 tsp pepper). Toss lightly. Then spread into an even layer, laying potatoes on one cut side. Roast in preheated oven for 30 - 35 minutes, turning potatoes to opposite cut side halfway through. Broil during last 1 - 2 minutes to crispen them up more. Sprinkle with a few more tablespoons parmesan and the parsley. Serve warm. For the sauce: Whisk together all ingredients in a small bowl. Serve with potato wedges. 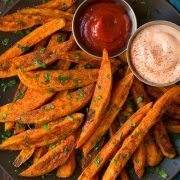 *I've tested these with both fresh garlic and garlic powder and I prefer the garlic powder because it doesn't develop that slightly bitter taste from being cooked at such a hot temperature for so long. If using fresh garlic, I recommend tossing it with a tiny bit of olive oil and waiting until halfway through to add it.